Oğuz Bey, is a 10 cabin gulet beautifully refitted in 2014 with elegant interiors, stylish decor and comfortable cabins. Compared with many gulets she has a rather more modern feel and style. One of the larger gulets she is spacious with plenty of room for relaxing on deck and on her upper flybridge, providing additional seating areas, and is ideal for exploring the Greek Islands or the coast of Turkey. She is owned by Emre Oğuz one of the most respected boat builders in Bodrum. Engine: 2 x 420 hp. Life aboard the gulet was an extraordinary combination of learning about the history and culture of the islands, exploring ashore, relaxing aboard, and enjoying the many water sports offered by the boat and crew. Our guides were expert, engaging and fun to spend time with. The crew was superb and the chef created amazing meals. 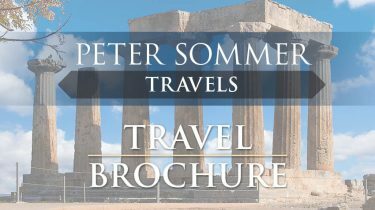 For those interested in learning the history of the region, while traveling in first class accommodations aboard a classic Turkish gulet, Peter Sommer Travels is a highly recommended choice. We are repeat customers with Peter Sommer Travels. We spent a week in company with a small number of like minded travellers, cruising the northern Dodecanese Islands with frequent excursions ashore to examine ancient and current attractions. The crew of four looked after our every need on board and provided excellent meals, our tour guide and our academic history commentator were excellent.